Fold the canvas over and begin stitching on a diagonal hooking the bit of canvas underneath to the folded over bit on the top. This is what it looks like a bit closer up… It’s easier to work in lengths of string that are about 1.5 feet, knotting off and starting up again. Yay! Here’s one side done – but now what do we do with those pesky corners? Fold over the other edge and tack down really well. Continue stitching and attaching your canvas down for the rest of the rug. Now when I asked around a lot of people actually finish their rugs by sewing a piece of felt onto the backside. I chose not to do this because felt is a fur magnet and I have a whole mess of cats. Can you say the underside of your rug is grody? But this canvas stuff is wicked slippery so I bought some non-skid rug padding. I trimmed it to size and went ahead and tacked it down with spray adhesive. It’s going to keep it in place for now, but over time it’ll come off so no worries when it’s time to wash it… it will peel right off. 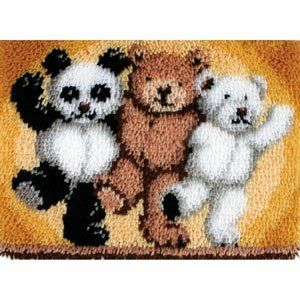 So, will you be making your own latch hook rug? Did you have fun? Do you still have the rug you made? Is it displayed in your home right now?